You've discovered the world of texting. Since you don't have your own phone, you need to use someone elses...which means yesterday I didn't have access to my phone for the majority of the day. You were busy with it...texting. So far, you've texted me & Nonnie, & writing little love notes to us throughout the day is your favorite thing. 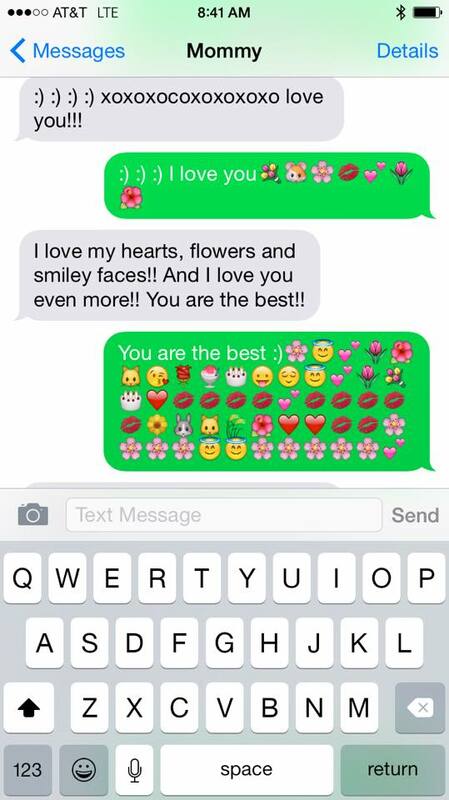 Your messages typically consist of small phrases about how much you love us & a whole lot of emojis. You love it when the iPhone suggests the word that you're trying to type so that you don't have to sound out & type out the whole thing. You're a little bit of a demanding texter. You expect a response right away, & will type "Why aren't you texting me back?" if more than a few minutes have gone by without a response. It's kind of hilarious. I can't decided if this is the cutest thing ever or the beginning of a really big problem. Sigh.